Lang Family Update: Look What WE Caught! It's definitly fishing season and Adam has been spending a lot of his free time on the water! 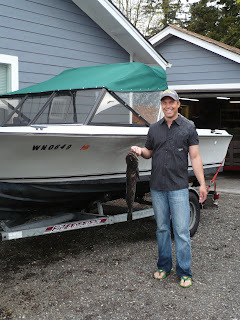 He caught this really ugly Lingcod, but it made great beer-battered fish. I'm not a very good fish photographer, yet. Look at these beautiful Dungess Crab we caught out at the mouth of the Nisqually river. They made an awesome fest! Jen you are too cute! So brave holding those crabs! Love all the new updates and I love that truck!